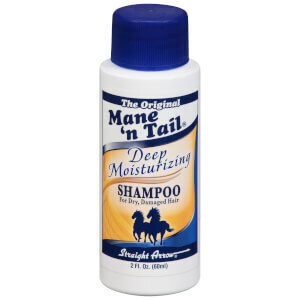 Treat dry, damaged hair to the Mane 'n Tail Deep Moisturizing Conditioner; a weightless formula dedicated to repairing, strengthening and hydrating from root to tip. Fortified with natural proteins and vitamins, the rejuvenating conditioner replenishes lost moisture, improves elasticity, and combats the damage caused by heat styling and environmental factors. 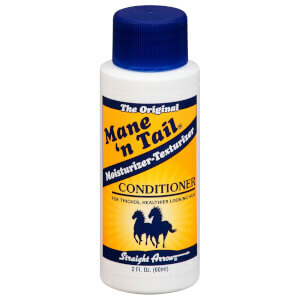 Restores soft, smooth hair with healthy-looking shine. Massér ind i nyvasket hår. Lad det trække ind i 1-2 minutter, og skyl ud derefter. Water/Aqua/Eau, Stearyl Alcohol, Cetearyl Alcohol, Cetyl Alcohol, Stearamidopropyl Dimethylamine Lactate, Behentrimonium Methosulfate, Cocus Nucifera (Coconut) Oil , Fragrance (Parfum), Cyclopentasiloxane, Glycerin, Dimethicone, Glycine Soja (Soybean) Oil, Isostearamidopropyl Morpholine Lactate, Olea Europaea (Olive) Fruit Oil, Panthenol, Tocopheryl Acetate, Hydrolzyed Wheat Protein, Methylchlorisothiazolinone/Methylisothiazolinone, Blue #1 (CI 42090), Yellow #5 (CI 19140), Butylphenyl Methylpropional.